Exclusive: Sunderland's former Manchester United and Rangers player is drafted into Craig Levein's pool to face Czech Republic and Spain. Phil Bardsley has been called up to the Scotland squad for the Euro 2012 double header with Czech Republic and Spain. The Sunderland right back, who had a spell on loan at Rangers in 2006, was born in England but qualifies through his father, who was born in Glasgow. Bardsley is currently training with the squad as they prepare to fly to Prague on Wednesday afternoon. His involvement against the Czechs was dependant on the SFA processing the necessary paperwork for him to become a Scotland international with approval arriving from FIFA and UEFA shortly before the team flew to Prague. Despite pressure from Sir Alex Ferguson and Walter Smith when he was 18, Bardsley previously turned down the opportunity to pledge his allegiance to Scotland. But he had a change of heart earlier this year, issuing a call to Craig Levein for him to be considered for his squad. Speaking in January, Bardsley said in the Mirror: “If they want me they know where I am. They can get my phone number and ask me. I am English but if another country wanted me to play for them I would be happy to listen. They should contact me. “My dad was born in Glasgow. He wasn’t up there long, but he was born there. Despite that, my dad has never said anything. He is not pushy. He just said you make the decision. “The only time it has really come up was when Sir Alex locked me in a room with Walter Smith when I was 18, which was a bit scary. “I was only young and it was a big commitment and I decided to keep my options open at the time. But I haven’t played for England so you never know." The Salford born defender started his career with Manchester United, rising through the youth ranks at Old Trafford to play 19 times for Ferguson's side. He struggled to displace Gary Neville and deputy Wes Brown at right back however and was sent out on loan to numerous clubs, including Royal Antwerp, Burnley, Aston Villa, Sheffield United and Rangers, with who he played seven times. 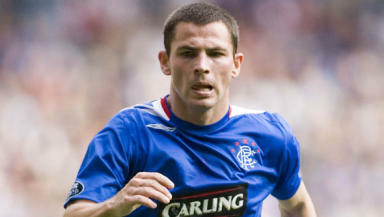 Bardsley played in SPL and UEFA Cup matches under Paul le Guen, before a reported bust-up ahead of a European game against Livorno saw him frozen out of the team. He last featured in a 1-0 home loss to Inverness Caley Thistle in October 2006, before returning to Manchester United in December. He then finished the season with Aston Villa in the English top flight and subsequently left Old Trafford to sign for Sunderland on a permanent basis in 2008, with Roy Keane taking him to the Stadium of Light in a £2 million move. His appearances in the Sunderland first team were curtailed by the loan signing of Alan Hutton, who he will join in the Scotland setup. Following Hutton's return to Tottenham Hotspur, Bardsley has made four starts from five appearances and played in the 0-0 draw against Manchester United at the weekend. Defenders: Hutton (Tottenham), Berra (Wolves), McManus (Middlesbrough), G Caldwell (Wigan), Weir (Rangers), Whittaker (Rangers), McEveley (Barnsley), McNaughton (Cardiff City), Bardsley (Sunderland). Midfielders: Adam (Blackpool), Dorrans (West Brom), McCulloch (Rangers, unavailable for Czech game), Fletcher (Manchester United), Morrison (West Brom), Robson (Middlesbrough), Cowie (Watford). Forwards: Maloney (Celtic); Fletcher (Wolves), Iwelumo (Burnley), Mackie (QPR), Miller (Rangers), Naismith (Rangers).